MOCRA Director Terrence Dempsey, S.J., is joined by two fellow museum directors: Pamela Ambrose (Loyola University Museum of Art, Chicago) and Ena Heller (Museum of Biblical Art). All three museums focus on art that engages the religious and spiritual dimensions. Ambrose, Heller, and Dempsey discuss a range of topics, including the place of religious art museums in the ecosystems of both art and religion, the challenges of presenting art in a spiritual and religious context, and the wide range of responses each director has fielded from visitors and critics alike. Ena Heller was born in Romania and studied at the Nicolae Grigorescu Institute of Fine Arts in Bucharest. After moving to the United States, she earned master's and doctorate degrees in art history from the Institute of Fine Arts at New York University. She has served as lecturer at the College of the Holy Cross in Massachusetts, adjunct professor at Manhattanville College in Purchase, N.Y., research assistant at New York's Metropolitan Museum of Art, and lecturer at its Cloisters Museum. Heller oversaw the transformation of the Gallery of the American Bible Society into the Museum of Biblical Art (MOBIA), which opened in 2005 with Heller as founding Executive Director. Heller left MOBIA in 2012 to become Bruce A. Beal Director of the Cornell Fine Arts Museum at Rollins College, Winter Park/Orlando, Florida. In 2010, the American Academy of Religion recognized Dr. Heller’s achievement with its prestigious Religion and the Arts Award, which is "presented annually to an artist, performer, critic, curator, or scholar who has made a recent significant contribution to the understanding of the relations among the arts and religions, both for the academy and for a broader public." Heller's scholarship includes editing and contributing to the volumes Perspectives on Medieval Art: Learning through Looking (2009) and Reluctant Partners: Art and Religion in Dialogue (2004) as well as the exhibition catalogs Tobi Kahn: Sacred Spaces for the 21st Century (2009) and Icons or Portraits? Images of Jesus and Mary from the Collection of Michael Hall (2001). The Gallery at the American Bible Society was established in 1998 as an exhibition space dedicated solely to art inspired by the Bible. The Gallery's exhibitions ranged from the history of the Holy Land to 20th-century Guatemalan and Peruvian folk art; from Romanov icons to contemporary Biblical art; and from medieval and Renaissance sculpture to African-American quilts. The gallery was succeeded in May 2005 by the Museum of Biblical Art (MOBIA) . Located in New York City's Columbus Circle, MOBIA's mission is to "celebrate and interpret art inspired by the Bible and its cultural legacy in Jewish and Christian traditions through exhibitions, education and scholarship." The Loyola University Museum of Art (LUMA) was founded in 2005 on the Water Tower Campus of Loyola University Chicago. LUMA is located on the Magnificent Mile in Lewis Towers, a historic 1926 Gothic Revival building. According to its mission statement, LUMA "reflects the University's Jesuit identity and is dedicated to helping people of all creeds to explore their faith and spiritual quest. The Museum interprets and displays the University's medieval, Renaissance, and Baroque collection, known as the Martin D'Arcy Collection, other museum permanent collections, and rotating exhibitions. Learn more about the D'Arcy collection. Visit the exhibition website for Sacred Geometry and Secular Science. Ena refers to two exhibitions. The first, The Body of Christ in the Art of Europe and New Spain, 1150-1800, was held in 1997 at the Museum of Fine Arts, Houston . It had an accompanying catalogue. The second was held at the National Gallery, London , in 2000. Curated by Neil MacGregor and titled The Image of Christ, it explored works in the National Gallery's own collection and was accompanied by a richly illustrated catalogue. MacGregor hosted a related BBC television series titled Salvation Salvation, also broadcast in 2000 and accompanied by a book of the same title. The Graduate Theological Union is a consortium of nine member schools located Berkeley, CA. Faculty members such as John Dillenberger, Jane Daggett Dillenberger, and Peter Selz, established a pioneering Art and Religion program that emphasized the interdisciplinary study of faith traditions and the arts. Sokolowski appeared on a previous episode of MOCRA Voices. Exit Art was founded in 1982 by Jeanette Ingberman and Papo Colo as an interdisciplinary cultural center that presented innovative exhibitions, films and performances. Exit art emphasized contemporary issues and ideas experimental forms of expression and emerging, under-recognized, mid-career and international artists. Exit Art closed on May 31, 2012. The Vatican Collections: The Papacy in Art was shown at the Metropolitan Museum of Art in 1982. The accompanying catalogue is now out of print, but can be downloaded as a free PDF. Additional information about the papacy, the Vatican, and art can be explored on the Met website. Andy Warhol's floating Silver Clouds (1966) were shown at MOCRA in 2001, 2002, and 2006, and shown at LUMA in 2008. Ena is likely referring to the exhibition The Word on the Street: The Photography of Larry Racioppo. Reluctant Partners: Art and Religion in Dialogue was published in 2006. Read Ena's summary of the book here. The recognition that today's audiences often need help decoding religious art of the past was directly addressed by The Image of Christ exhibition and Seeing Salvation series. See discussion at 6:45 above. MOCRA is the world's first interfaith museum of contemporary art that engages religious and spiritual themes. MOCRA is dedicated to the ongoing dialogue between contemporary artists and the world's faith traditions, and to serving as a forum for interfaith understanding. In a time when religion is viewed by many in exclusive ways, MOCRA intends to be inclusive and embracing, a center for healing and reconciliation. The exhibition Art of the Invisible was presented in 1977 at Bede Gallery, in Jarrow, Tyne and Wear, United Kingdom. It was later staged in at the Institute of Contemporary Arts in London as The Art of the Invisible: the spiritual in art - the art of the spiritual. It included works by William Blake, Piet Mondrian and Wassily Kandinsky, among others. Coincidentally, an unrelated exhibition titled Invisible: Art about the Unseen, 1957-2012 was presented at the Hayward Gallery, London, in 2012. Read a review from The Guardian here. You can also see footage of the exhibition in this report from Al Jazeera TV. The Spiritual in Art: Abstract Painting 1890-1985 was mounted at the Los Angeles County Museum of Art (LACMA) in 1986. The exhibition sought to show how one current in abstract art that thrived in the early twentieth century -- concern for the spiritual, including references to popular belief systems such as Theosophy and Rosicrucianism -- was eclipsed but not completely extinguished. The catalogue was revised in 1999. Kasimir Malevich (1878-1935) was a Russian painter, designer, and art theoretician, and a leading pioneer of abstract art. He is perhaps best known for the development of a style of severe geometric abstraction he called Suprematism. Read about Malevich in this helpful introduction from the MoMA website. Kasimir Malevich, Suprematist Composition: White on White, 1918. Oil on canvas. Collection of the Museum of Modern Art. Wassily Kandinsky (1866-1944), like Malevich, was born in Russia, but worked primarily outside of his homeland. He was a painter, printmaker, stage designer, decorative artist and theorist, and was a central figure in the transition from representational to abstract art. Read about Kandinsky in this helpful introduction from the MoMA website. In 1911 Kandinsky published a theoretical treatise titled Concerning the Spiritual in Art (also translated as On the Spiritual in Art). His concerns range beyond the purely visual to encompass music and poetry; among the concepts he proposes is a double effect of color: a purely physical effect on the eye, and a deeper effect causing a vibration of the soul or an "inner resonance." He compares the spiritual life of humanity to a pyramid; the artist has a mission to lead others to the pinnacle with his work, and only the greatest of artists reach those heights. Kandinsky was influenced in his thought by Theosophy, a philosophical-religious system popularized in the late 19th and early 20th centuries by Madame Blavatsky. Download a PDF of Concerning the Spiritual in Art here. Art critic Donald Cuspit composed a reflection on Kandinsky's treatise . James Elkins teaches at the School of the Art Institute of Chicago. His book On the Strange Place of Religion in Contemporary Art was published in 2004. Watch a video of a presentation on the topic by Elkins here. Visit Elkins' website here. Salvador Dalí, The Sacrament of the Last Supper, 1955. Oil on canvas. Collection of the National Gallery of Art, Washington, DC. 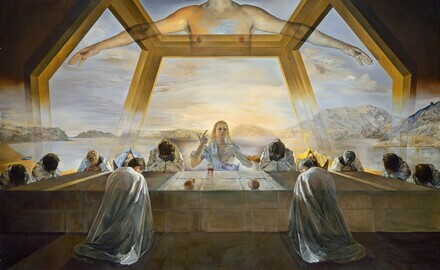 This well-known 1955 painting by Salvador Dalí is titled The Sacrament of the Last Supper. Download a PDF from the National Gallery discussing the work. Or, visit the official Salvador Dalí website here. The phrase ex opere operato is a Latin phrase drawn from Catholic sacramental theology. Meaning "from the work done," it indicates the belief that the efficacy of a sacrament derives from the action of the sacrament and not from the merits or holiness of the priest or minister performing the sacrament. The Royal Alberta Museum mounted an exhibition in 2000 titled Anno Domini: Jesus through the Centuries. A virtual version of the exhibition can be visited here. An exhibition catalogue was also published -- view its WorldCat listing here. See the discussion of Seeing Salvation above, at 6:45. The exhibition Caravaggio: The Final Years was shown at the National Gallery, London, in 2005. Read about the exhibition in this article from The Guardian. An exhibition DVD is available from the National Gallery. The exhibition The Sacred Made Real , a "landmark reappraisal of religious art from the Spanish Golden Age with works created to shock the senses and stir the soul," was shown at the National Gallery, London, in 2009. Download the exhibition guide here . An exhibition DVD and catalogue are also available from the National Gallery. The Missing Peace is a touring exhibition that was shown at LUMA in 2006. See images from the LUMA installation here. The exhibition continues to tour. Visit The Missing Peace website to tour a "virtual exhibition." One of the works in The Missing Peace, Lewis deSoto's Paranirvana, was featured in a solo exhibition at MOCRA in 2000. Passion in Venice was shown at MOBIA in 2011. The exhibition considered the ongoing conventions and artistic permutations of the visual presentation of Christ as the "Man of Sorrows." A catalogue accompanied the exhibition. Learn more about the Man of Sorrows tradition here. Tobi Kahn: Sacred Spaces for the 21st Century was presented at MOBIA in 2009. The exhibition featured paintings and sculptures that bridge public and private spaces, suitable both for artistic enjoyment and liturgical ritual. A catalogue accompanied the exhibition. Tobi Kahn has been the subject of two solo exhibitions at MOCRA (Metamorphoses in 1998 and Avoda in 2003) and several of his works are in the MOCRA collection. Visit Tobi Kahn's website here. Consecrations: The Spiritual in Art in the Time of AIDS. Installation view at MOCRA, 1994. Photo by Cheryl Ungar. Consecrations: The Spiritual in Art in the Time of AIDS was organized and curated by MOCRA Director Terrence Dempsey, SJ, and presented at MOCRA in 1994. The exhibition brought MOCRA wide acclaim and notice in the art world and the general public. Visit the exhibition website here.